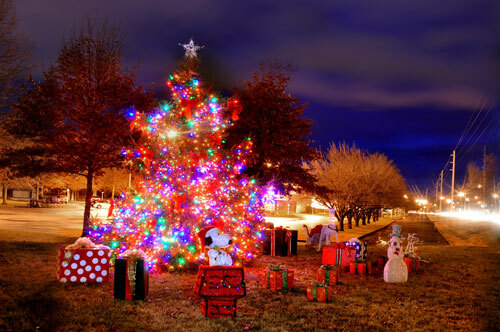 The City of Oak Ridge Recreation and Parks Department is teaming up with the Recreation and Parks Advisory Board to co-sponsor the Annual Community Christmas Tree Lighting. The ceremony is set for Friday, November 30, 2018, beginning at 6:30 p.m. in A.K. Bissell Park. Everyone is invited to the outdoor pavilion stage located behind the Oak Ridge Civic Center for holiday music and refreshments. New this year, the entire program will take place outside in the park (weather permitting). Guests are encouraged to dress appropriately. In the event of rain, the first part of the program will take place in the Civic Center gymnasium. At the conclusion of the announcements and music program, participants will proceed to the Secret City Commemorative Walk area on the east side of the Oak Ridge Public Library parking lot for the countdown and tree lighting. A shuttle cart will be available for guests that need assistance to and from the parking area. Seating will be provided by the pavilion stage. Seasonal music this year is provided by the Linden Elementary School Choir and the Oak Ridge Community Band. Refreshments will be provided by UCOR and the Recreation and Parks Advisory Board. Visit the City of Oak Ridge Recreation and Parks Department website at www.orrecparks.org or call (865) 425-3450 for additional information on special events and programs.